Asparagales is an order of flowering plants. The order must include the family Asparagaceae, but other families included in the order have varied markedly between different classifications. No one is sure, but it is supposed that this group of plants evolved between the late and early Cretaceous. But because of the difficult classification of the families, it is not entirely certain when they evolved. 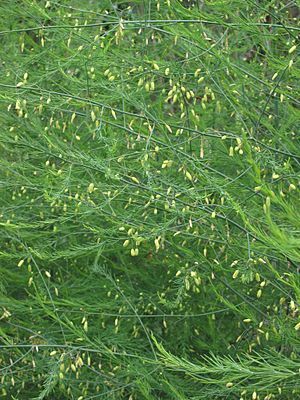 Asparagales have a large number of families, including Ashphodelaceae (Xanthorrhoeaceae), which includes daylilies and new zealand flax. Asparagales Facts for Kids. Kiddle Encyclopedia.